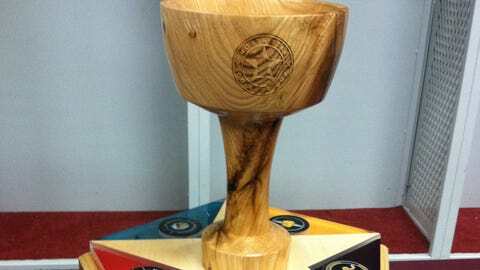 The winner of this weekend's inaugural North Star College Cup will take home this wooden trophy made of oak and birch, with pucks from each of the five schools embedded in it. MINNEAPOLIS — Kyle Rau has already won a state tournament at the Xcel Energy Center. He’s hoping to add another this weekend. Rau and the Gophers will take part in the inaugural North Star College Cup, an event that brings together the five Division I college hockey programs in the state of Minnesota. Because of the odd number of teams, one school sits out each year. The Gophers, however, will be a staple in every tournament. The North Star College Cup allows the University of Minnesota to face the other in-state teams once a year now that the Gophers have left the WCHA to join the Big Ten Conference. The winner of the annual event will also have bragging rights as the best team in the State of Hockey. The tournament begins this weekend at the Xcel Energy Center in St. Paul, with Minnesota State and Minnesota-Duluth facing off in the first game and No. 1 Minnesota and No. 5 St. Cloud State playing in the night cap. Bemidji State is the odd team out this year. Xcel Energy Center, home of the Minnesota Wild, is the same building where Rau celebrated a high school state championship as a member of the Eden Prairie Eagles. Needless to say, he’s had some fond memories there. "Hopefully we make some more good ones," Rau said. The winner of the two games Friday will face off in the championship game Saturday night. Saturday’s victor will take home a wooden trophy made of oak and birch, with pucks from each of the five schools embedded in the trophy. For the top-ranked Gophers, winning this weekend’s tournament would be about more than just the trophy. "It’s really just a battle of Minnesota teams," said freshman defenseman Michael Brodzinski. "Whoever wins is considered the No. 1 team in Minnesota. Hopefully we can win that one." Friday night’s matchup will have extra meaning for Brodzinski. His older brother, Jonny, is a sophomore forward at St. Cloud State. The younger Brodzinski brother says he and Jonny are best friends. They were even taken just seven picks apart in the 2013 NHL Draft. Yet for as close as Michael and Jonny Brodzinski are, there’s plenty on the line this weekend as they face each other for the first time as college foes. "I do have a scar on my forehead from when he kicked me off a chair when I was three or four years old," Michael Brodzinski said. "I’ll try to get him back on that one." When Minnesota bolted for the Big Ten after last season, fans worried about what would happen to the in-state rivalries. The Gophers’ clashes with the Bulldogs of Duluth or the Huskies of St. Cloud would no longer be a regular occurrence, and the meetings no longer carried the same weight as when the WCHA standings were on the line. So Gophers coach Don Lucia and others came up with what is now the North Star College Cup. One weekend, one building, four Minnesota teams. "It’s something that can maybe replicate what the WCHA Final Five was all about," Lucia said. "It’s a destination for the fans for the state of Minnesota and a focal point for a weekend in January. I think it’ll be a great tournament." This tournament marks the third weekend in a row in which the Gophers have a bit of a unique slate of games. 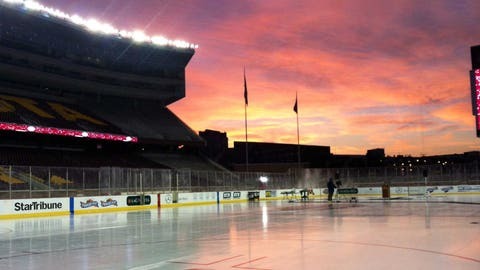 Minnesota played at Penn State on a Sunday and Monday earlier this month, and then followed that up with an outdoor game at TCF Bank Stadium last Friday. While the tournament makes for yet another unusual weekend, it also adds excitement for the Gophers in the middle of the season. "January can be a difficult month in college hockey because we do have such a long season," Lucia said. "It’s a long time before the playoffs still, but these last couple weekends really gives you something to look forward to." The future landscape of college hockey remains uncertain, as conferences could certainly look different in a few years. It remains to be seen if the Big Ten will expand, or if other schools will move between conferences. The goal of the North Star College Cup was to ensure the five Minnesota schools would at least have the tournament to look forward to every year, regardless of whether or not they’re conference rivals. "There were talks about trying to have this tournament years ago, but when you’re playing each other four times or more, it didn’t make a lot of sense," Lucia said. "Now with some teams not seeing each other during the course of the year, now is when it made sense to do it. "I think this has an opportunity to be a real highlight for all the teams during the course of the season."